Big Thing Point: What's New? 12 April 2008: Gigs page updated, and new Pointy Boss photos added. 02 February 2008: Gigs page updated, and new Pointy Boss photos added. 15 April 2007: Links to new Pointy Boss photos and Pointy Boss MySpace site added. 3 December 2006: More Toward Seven CD added to site - with three tracks for streaming in RealAudio, the same three for downloading in MP3 and the whole darned thing for buying online. 3 September 2006: Gigs page updated with news of the latest Autumn 2006 dates. 13 December 2005: Photos and report from the 27 Novembtargeter Old Angel gig added. 27 November 2005: New BiG THiNG Pointy blog online now - latest news and happenings from the world of Pointy Boss. 19 November 2005: Photos from the 18 November Sumac Centre benefit gig, with KaiZen and The Tramadolls added. 11 May 2005: News page updated with details of the new 'Anti-War' anarcho-punk compilation CD, and Homepage and Gigs page updated with news of upcoming June 9 2005 gig at The Old Angel, Hockley, Nottingham. 04 October 2004: Gigs page updated with photos & comment from the June 2004 Sutton-in-Ashfield all-dayer. 17 June 2004: News page updated with 'Pointy Barn' conspiracy story. 14 June 2004: All about Pointy Boss and FAQs tweaked. 13 June 2004: Guestbook updated here. 09 May 2004: Samples from the new Pointy Boss CD Things Like That added here — and new 'buy Pointy Boss CDs on-line' service added here. 04 March 2004: Details up the upcoming Pointy Boss CD album added here. February 2004: News and Biography pages updated, and other updates across other pages to take account of Brian joining the band as a permanent member! 13 October 2003: Latest update on the Brand New Rage UK Subs tribute CD; and news of Pointy Boss' new drummer Brian. 11 August 2003: Updates include: news of Nik's departure; the hunt for a new drummer; and the original sleeve notes for the Brand New Rage release. 07 July 2003: Photos and comment from the fifth Old Vic, Nottingham gig  finally  added here. 30 May 2003: News of the upcoming UK Subs tribute CD  Brand New Rage  complete with Pointy Boss tracks added. Credits; FAQs; and All About pages, tweaked. 05 January 2003: Gigs pages updated, with photos and reports from the third and fourth Old Vic, Nottingham gigs and the Newark gig from 2001-02, see here. 02 January 2003: Gigs pages updated, with photos and reports from The Clinton Arms, Nottingham, The Victoria Inn, Derby and The Green Room, Chesterfield, gigs from 2002, see here. 18 November 2002: Gigs listing updated to catch-up on a spate of dates, here. 20 March 2002: Pete's biography page updated, with full band history's, here. 09 January 2002: Photos and comments on the Bunkers Hill gig here; and the Brown Cow gig here. News on the Metro Youth interview in MAXIMUM ROCKNROLL added here. August 29 2001: News page updated with report on first No Frills, No Glitz web review here. July 8 2001: Guestbook up-and-running, with first (and so far only) entry, here. July 1 2001: Photos and report from 19 July Old Vic gig added here. New photos added to Gallery. News of gig cancellations and rescheduling added. June 7 2001: News of gigs at The Brown Cow, Mansfield (Friday 6 July) and Bunkers Hill, Nottingham (Friday 13 July) added. May 26 2001: News of 19 June gig at The Old Vic added here. New black-and-white photos added to Gallery. Link to MP3 versions of No Frills, No Glitz at Pointed Remarks added. April 19 2001: RealAudio versions of all four tracks from No Frills, No Glitz added here. April 1 2001: Photos from the 23 February gig added here. Pointy CDs for sale on-line at the punkrockshop plugged. February 26 2001: Links to the first (and probably last) unofficial Pointy Boss website Pointed Remarks complete with MP3 tracks ready to download; and to Punk and Oi in the UK website added to Links page. January 14 2001: New 'All about Pointy Boss' page added; new Guestbook form set up; News page updated. December 15: Photos from the December 1 gig and December 7 gig added. December 2: Front page updated, with report on the gig with the UK Subs at the Running Horse, Nottingham on December 1, and details of the 7 December gig added. FAQs, Gigs, Credits and News pages tweaked. November 17: Confirmation of Friday 1 December gig, supporting the UK Subs at the Running Horse, Nottingham, posted on the front page. October 1: First photos and comments on the Old Vic gig posted here. September 14: Details of September 26 gig at the Old Vic, Fletcher Gate, Nottingham posted on Gigs page. July 31: News of next gig, on Tuesday 26 September, posted on Gigs page. July 16: First print review of We Are Demo assessed on News page. July 11: Nik's Biography page updated. Now with 'added detail'. June 16: New pictures added to Pete's Biography page. Channel Stoopid's CD label 'High Society International' website added to Links page. June 12: Link to Nicky Garratt's tour diary entry for the December 1999 Nottingham gig added to Gigs page. New search engine listings added to Links page. June 3: Site search engine added. "Pete's Nottingham Promo' Site" added to Links page. May 30: Four demo tracks, in RealAudio format added; Song poll and Guestbook added; Biography and other pages revised as part of major design overhaul. May 20: News page redesigned and updated with stories on the Pointy Boss demo, and a CD release for an old Metro Youth number; Links page updated; Credits and FAQ list tweaked. February 20: Photos from the 999 gig at Running Horse added; link to the Running Horse site added to Links page; News page updated with story on band's recording plans. January 16: Poster for 999 gig at Running Horse on 8 February 2000 added. January 10: News page added, including news of a review of the first gig. January 6 2000: New Links page added. Five additional sets of song lyrics posted. December 22: Link to the new 'official' 999 website "High Energy Plan" added to Gigs page. December 20: Six photos from Pointy Boss' debut gig, supporting the UK Subs at the Running Horse, Nottingham on December 14, added to the Gallery page. Keith's biography page updated. 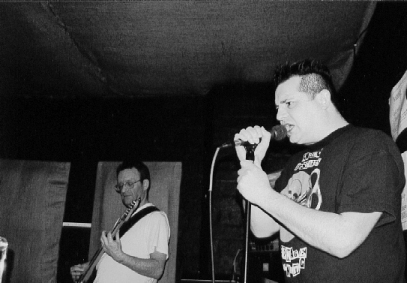 Gigs page updated with news of Pointy Boss' second gig on 8 February 2000. Site credit list revised and extended. December 9: Web counter added to BiG THiNG POiNT entry page to record details of site traffic. December 8: Link to Official UK Subs Website added to Gigs page. December 6 1999: BiG THiNG POiNT went live and global.